HI De Blauwput Leuven i Leuven, Belgia: Bestill nå! 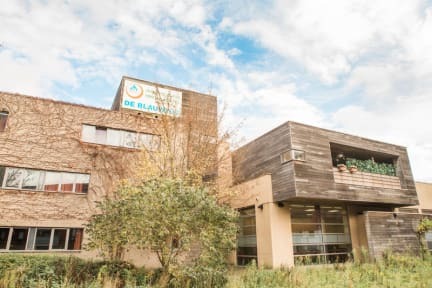 The Hosteling International youth hostel in Leuven, situated just behind the train station, is an ideal basis for exploring the historical city with its many ancient buildings and large collection of pubs. Also the surroundings in the green belt around Brussels can be explored from this youth hostel. The hostel has 2 to 6-bedded rooms all with en-suite facilities. A great buffet-style breakfast is included in the overnight rate. The hostel bar might be the perfect starting point for your exploration of this university town's night life. With more than 33.000 students in town, there's always something to do. Although the reception is only open until 11pm, guests have 24h/24h acces. No curfew & no lockout. Rooms are available from 3pm. If possible, please check in between 3pm & 10pm. Internet access: Free WiFi - Public computer (charges apply) available at the hostel. If you book online we'll offer you 1/2 hour free internet access.